Over 12 pages of Word Wall Center Sheets to make your Word Wall Interactive. Also includes Display parts. All are modifiable in word!!! These word wall activities are designed to be an interactive tool for students to use. Although typically associated with reading and writing instruction, word walls are becoming commonplace in classrooms for all subject areas due to their ability to foster phonemic awareness, display connections throughout word "families" , serve as a reference for students, as well as create meaningful experiences with new vocabulary words. This set includes a display as well as activities. All files can be modified in word to meet your classrooms needs. Files are zipped so that I can provide them in word and pdf. Word Wall Display — This file is in Word and PDF. You can modify this file in word. I have included all the Word Wall Letters for your display. Also included are the first 100 Fry Words. You can add more words since this is a editable document!!! The colors are cool blue and yellow. Goes great with our Ocean Decorations Packet as well! 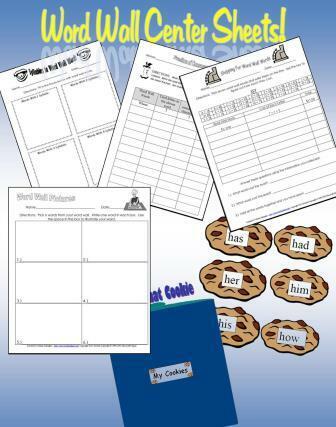 Bonus Sight Word Game—A Cookie themed sight word game that includes words on cookies, but you could modify the words in the game to match your word wall words.